Self-confidence is essential for aspiring leaders because without it you will find it almost impossible to release your enthusiasm. Demonstrations of enthusiasm are a powerful tool for any leader because they energise teams. This works because enthusiasm is a contagious emotion. If the leader shows his/her enthusiasm the team tend to catch it. However, you need the self-confidence to really “go for it” when you are showing enthusiasm or it will appear that you are faking it. This could produce the opposite effect on team motivation from that which you desire. The issue that many leaders tend to have with self-confidence is that it goes up and down during the course of the day. To be consistent in your self-confidence you need to manage how you feel at any given moment. 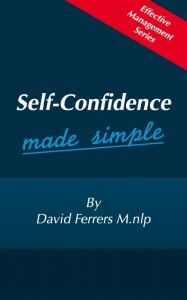 That is why I place considerable emphasis on the simple exercises in my book Self-Confidence Made Simple. If you do these exercises regularly you will find that in no time you learn the exercises. Then you will be able to use the simple exercises whenever you need them to raise your self-confidence in any situation.